Celebrate a unique reggae revolution at uShaka Marine World’s restaurant, Wahooz on the Promenade on Saturday, April 6th from 10 am – 8 pm. Although reggae originated in Jamaica in the late 1960s, it also has its musical roots in New Orleans R&B and beyond. It relies on skittering guitar and syncopated rhythms and is probably most associated with Rasta legend Bob Marley and pop band UB40. However, it’s laid back vibe has been interpreted and reinterpreted over the decades. That makes it the very best musical genre to relax to on a hot summer day on the Golden Mile with an ice cold beverage or a cocktail in hand. 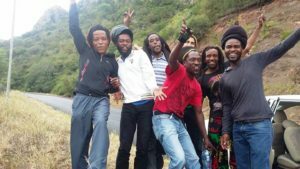 The local muso’s who have made reggae their own and who’ll be jamming at the 2019 Rasta Rave include; Tuff Masters Family Band, The Meditators Reggae Band, Holy Fire Band, R@w, Luwe da Lion, Trinity, Roots of Kush, HottWaxx Family Selektors and more. Catch The Meditators – regulars at this popular uShaka Marine World promenade venue – is a six-piece reggae band based in Durban. Founded by bandleader and lead guitarist and vocalist, Shante Bekwa in 1991, the group also includes Dan Msomi on rhythm guitar and vocals, Bunny Nathi Mkhize on drums, Sfiso Mpanza on the keyboard and backing vocals, Barret Hlela on bass guitar and Alberto Chemane on percussion. Roots of Kush is a Durban based contemporary reggae band featuring lead female bassist and lead vocalist Mpume while the unique Luwe da Lion is also a home-grown reggae talent. Trinity – aka Sebelo Clarence Langa – who hails from Hammarsdale, was fed a staple diet of reggae music by his father. This contributed to his distinctive blend of roots reggae with a touch of hip hop and dancehall. There are a limited number of tickets available at just R60 per person and can be bought at computicket. So book now and celebrate Wahooz Rasta style. For enquiries, contact uShaka Marine World on 031 328-8000 during office hours!